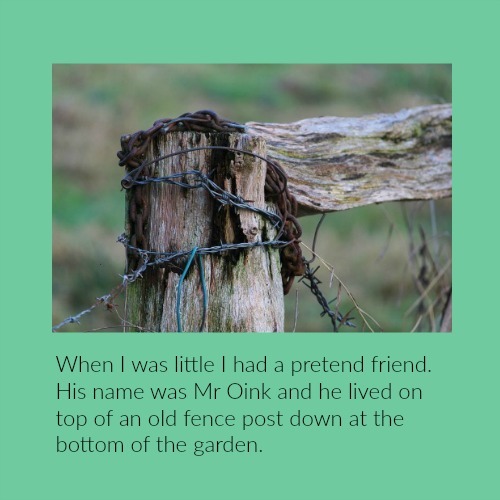 When I was a very little child I had a pretend friend called Mr Oink. Why he was named that, I can't remember. However I do recall that he lived on top of a very large old strainer post down the back garden and that I talked to him for hours. He got stories, songs and the confessions and secrets of a three year old. Years later I learned that creating a single imaginary friend out of an audience was a successful strategy for dealing with public speaking fear as well as an aid to successful delivery. Mr Oink was back in another guise, revamped and renamed. To understand how creating a pretend friend works please think of someone with whom you feel totally at ease. Now think about how you feel while you are talking with that special friend. It's highly likely you'll feel relaxed and the conversation you're sharing is pleasurable to both you and your friend. You'll also notice how open and free to be spontaneous you are and that your speech is fluent and natural sounding. What you won't sense or see in your behavior are any signs of anxiety, feeling threatened or defensiveness. ... are desirable as a speaker. Audiences warm to those who have them and in response they feel comfortable, appreciated and understood. If the speaker feels OK about themselves and what they're doing, the audience is highly likely to feel the same way. It's a case of self-perpetuating mutual positive reinforcement. What goes around, comes around. To get from a conversation with a friend to a conversation with an audience while retaining the former's positive characteristics something needs to happen. That something is Mr Oink. The audience needs to become his equivalent in your mind - your very, very good, imaginary friend. What unites this audience, bringing them together to listen to you? What demographic do they share? What themes/interests/concerns are common within that grouping? Are there specific cultural bonds that tie them together? What is the dominating age group or gender? What generalities (themes/interests/concerns) can you draw from that? Once you have your answers you're ready to build a picture of your friend along with their characteristics. It helps to give them a name, a face and a body! See them as a real person - someone you can talk with. The stronger you make the image the more you will be able to relate to it. If you find the idea too nebulous, too wishy-washy for you, put it down on paper to assist the process. Here's an example. Let me introduce you to Mary. She'll be in the audience listening to my speech on establishing good reading skills in children. Mary is married and in her mid-thirties. She balances her time between looking after her family and a job to help support them. Her concerns are time management- finding the time to do all that she wants/ or thinks she needs to do to look after her family well and work: cook, clean, supervise homework, run her children to their after school classes and so on. Can you see her yet? Now if you were talking to someone you made up around your speech and its occasion, would that help you get over the fear you feel when standing in front of an audience? I sincerely hope it does. Making a friend of the audience works for me, and I wish the same for you. Here's to the reincarnation of Mr Oink! PS. Here's a page on building rapport with audiences. It will help you create your friend. PPS. Here's the Wikipedia page if you want to find out more about imaginary friends. The six qualities of an inspiring speaker - A gem of a post from Ginger Public Speaking on what it takes to be more than good. It's a short (2 minute) read with long term benefits.